Content is viewed in a list. To view more content, the user puts his finger on the screen, and swipes it up. The screen moves up with the finger in the same direction. The user can also swipe in the opposite direction. An indicator shows how much content is still available. When the user lets the screen go, it stays in the same position. When content doesn't fit the screen, the user should be able to scroll up. To keep control over the movement of the screen the user can use the 'slide' gesture. This way he can control the speed and how far the screen slides up. The slide to scroll gesture is often used for reading. It is a standard gesture, so it should always be available. When the user wants to scroll up faster, he can use the fling to scroll gesture (this option should also always be available), or use the scroll thumb. 1 In Twitter users have to scroll down the timeline to read all the tweets. 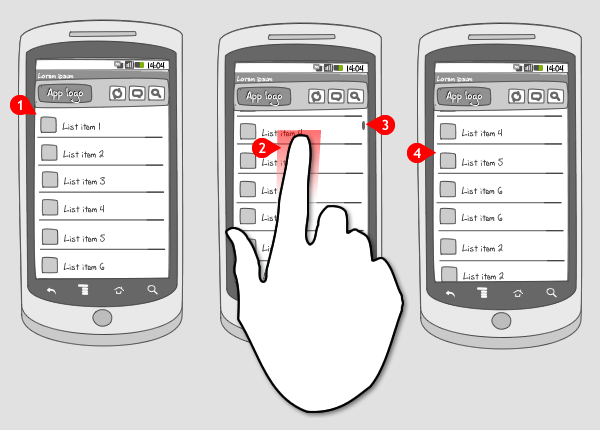 When the user puts his finger on the screen and slides it down, the screen moves with the finger until the finger is released. In the animation shown above, the finger is slided down three times. please give me it’s source.